Molly Sterling music takes on a dark and deep direction, and has been compared to Lana Del Ray & Hannah Reid from London Grammar! Support from Jackie Beverley on the night! Grammy Award winning singer/songwriter Ray LaMontagne brings his Just Passing Through acoustic tour to Bord Gáis Energy Theatre as part of his first UK & Ireland tour in seven years. Brad Mehlua will perform for the first time in a number of years alongside Larry Grenadier on double-bass & Jeff Ballard on drums! Paul Kalkbrenner returns to Dublin for his first headline show here since 2012. Tickets were in huge demand for this so it’s no wonder it is SOLD OUT! Bedouine will return to Dublin to perform at Whelan’s on Wednesday evening following her stunning show at The Grand Social last November. Doors 8PM! 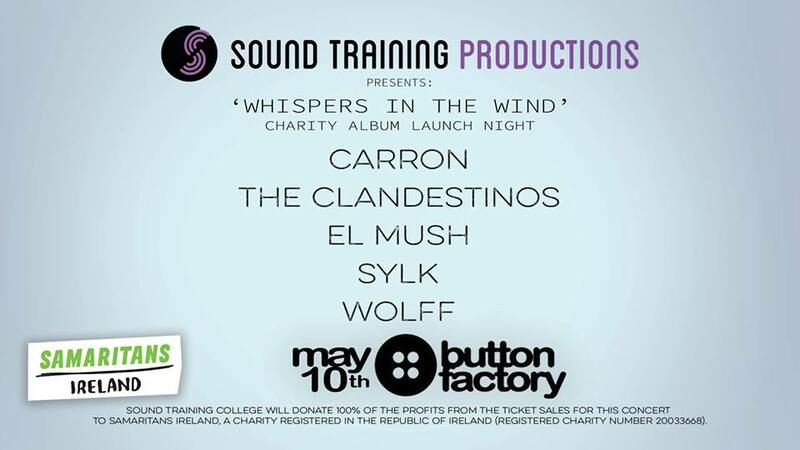 Sound Training Productions present this year’s charity album launch! All proceeds on the night will go towards Samaritans Ireland! Performances on the night from CARRON, WOLFF, The Clandestinos, El Mush & SYLK plus a very special guest performance on the night! Noel Gallagher performs in the 3 Arena with the High Flying Birds also on Thursday night! In promotion of the new album “WHO BUILT THE MOON?”! Doors from 6.30PM! Sébastien Léger has been one of the most unique and captivating producers the techno scene has brought forward over the past decade. His live shows are always fantastic and this should be no different! Krystal Klear returns to District 8 once again! Launching his new EP ‘The Division’ which was was released last month on Running Back! The Division features what has been said to be one of the tracks of the summer, Neutron Dance.. be sure to check it out! Indie rockers who were apart of the NME indie brigade in the early 00’s are still going strong! With the release of ‘MEGAPLEX’ last month the group will be touring the album around Europe for the next few months! Tickets only €19! The singer-songwriter/multi-instrumentalist/producer with a voice that you may not expect to come out of that body makes his return to The Sugar Club after his fantastic gig there last April!